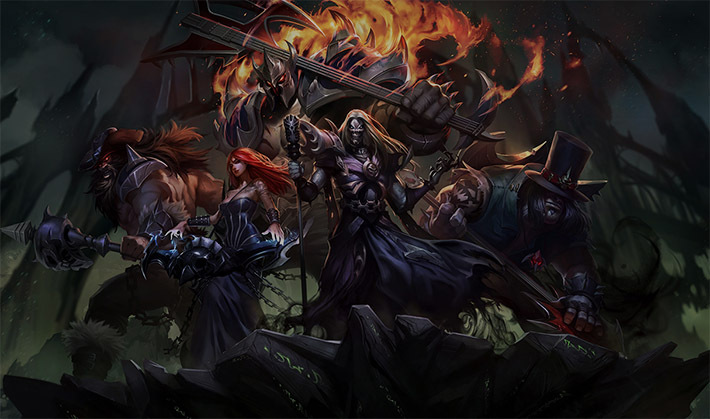 Pentakill is a line of skins in the LoL representing many familiar champions in the form of the Runeterra’s world greatest Metal group. In the alternative universe, where the Runterra came the era of Metal, the Pentakill group was born. And they will destroy the planet to the ground with their deafening riffs and downhole rhythm. Maybe the hair of their music reached you, and if not, right now you can download their albums and enjoy excellent music that born straight in the company Riot Games. All of us were witnesses as the true voice of the metal subsided, outnumbered by the whisper of the majority. But listen carefully and you will see the seed of truth. The Five Harbingers of Destruction waited patiently for hours of their exaltation. And on the chosen day and hour, these five angels will change our world forever. The purest sound has never reached such high, their voices have already killed all the Dragons and destroyed the Baron himself. Even the minions of Teemo could not stop the coming of the chosen ones, which will forever change our twisted souls forever. The enemies of the Metal tremble in fear only after mentioning their name … Pentakill. Kayle descended to us from the heavens themselves, and the only way of communication of this divine being is singing the great symphonic Metal Operas. The incredible depth of sadness is heard in her voice and many drops dead from melancholy towards the end of the performance. Karthus during his lifetime was a great vocalist, so the Death will not let go him so easily. Now he is a living embodiment of the ideal voice, which will penetrate into the most secret corners of your soul and turn it inside out. The hunched figure of Yorick, awakened by Karthus and Kayle, was heading south, leaving a bloody trail behind. His unique bass guitar is an excellent instrument for both crumbling stones and skulls and destroying the eardrums of all living beings. Deep beneath the mountain, Sona was imprisoned, where she waited for the coming of the remaining harbingers. All these years of imprisonment, she trained in her deadly art of playing keyboards. And in the end, she reached such heights that she can easily lift the volcanic islands from the depths. She easily manages the hot-heated heart of the Runeterra using only her keyboard. 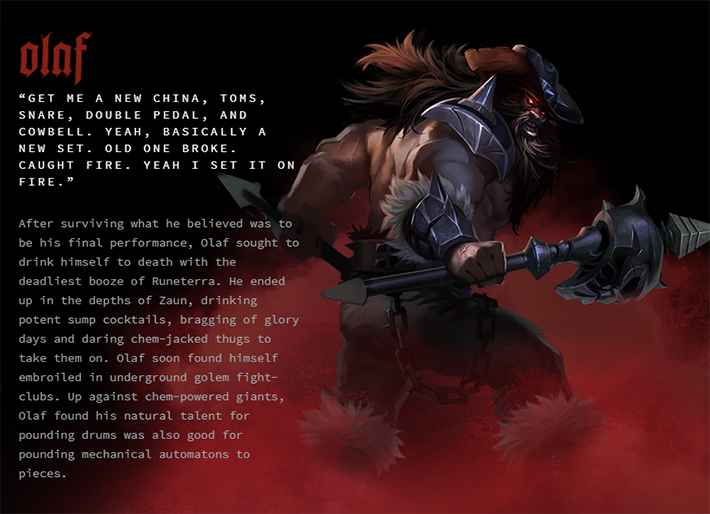 Olaf revealed his gift as a drummer when he fought with golems in fight clubs. He easily defeated the most dangerous opponents with his unique technique and issued surprisingly pleasant sounds at each blow of his mace. Now he joined the harbingers with only one purpose – to return the Metal on the Runeterra. Mordekaiser was reborn as an immortal being, which is bound by an oath – to bring metal to the masses, and now nothing dares to stand in his way. Before we continue our Pentakill skins review, I want to remind that Boosteria has the affordable prices for boosting services. Pentakill Karthus was introduced to us in the role of a singer in the heavy metal band – Pentakill. This time our gloomy reaper put off his scythe and his gloomy robe because it’s time to speak to the public! Karthus picked up his microphone, dressed in a decent suit and now he looks like a real metal band singer. In general, the skin does not look bad, and even the solution that the developers took with the weapon is interesting – they just turned it into a microphone stand with the microphone itself. The elegant move, which only emphasizes his role in the group. Pentakill Karthus catches the eye and new sound voice lines only add uniqueness to this skin. Since this is an old skin, no new animations and particle effects have been added, but the price is also reduced accordingly. Summarizing all of the above, I want to note that Pentakill Karthus is clearly worthy of a purchase, especially if you appreciate the work of this metal band. You can buy Pentakill Karthus skin for 750 RP in the LoL in-game store. 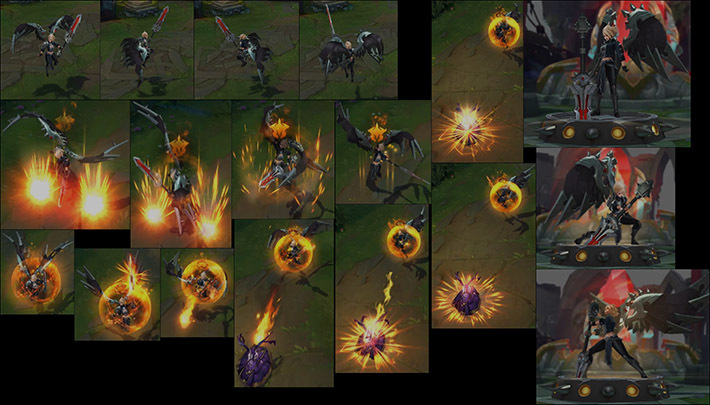 Pentakill Kayle, my personal favorite, is presented to us as a back – vocalist of the metal band. Dressed in all black, with an interesting light hairstyle and gorgeous metal wings perfectly emphasize her new image. The visual effects are performed exactly as I expected, more fire to the fiery god! All abilities surround our champion with a sheaf of sparks, and enhanced auto attacks are made in the form of beautiful fireballs. The Sound effects are just lovely, especially taking into account my love for this genre of music. Each ability, each attack is accompanied by a good sound chord, and a new taunt pleases my ears. 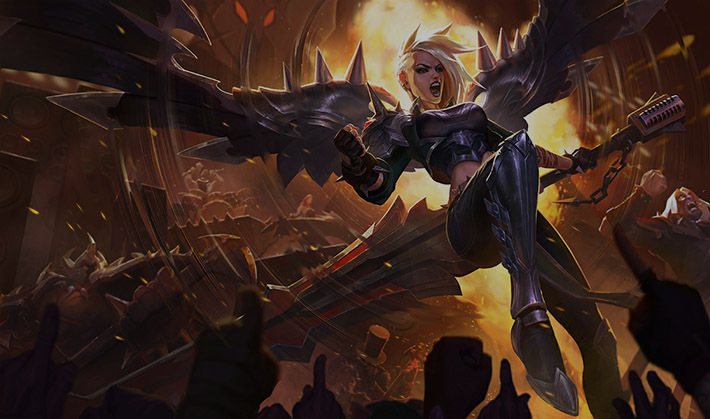 Strictly recommend Pentakill Kayle for every metal lover, even if you do not often play for Kayle, then just buy this skin to support the creators of such high-quality music. You can buy Pentakill Kayle skin for 1350 RP in the LoL in-game store. Pentakill Mordekaiser presented to us as a giant with an electric axe-guitar. Half naked, with giant shoulder plates and gloomy helmet. Classical look of the guitarist of the hard rock band and Mordekaiser is blindly following this path, path of the Master of Metal. The hard metal aesthetic is effectively showed to us through his armor. His classical mace was adapted to the axe-guitar which is a very clever turn of the Riot Games. This is rather old skin, without any other particle effects, sound and animations. I still wonder why Pentakill Karthus cost less then Pentakill Mordekaiser but has all the same features, and just cannot recommend this skin, due to the high cost. You can buy Pentakill Mordekaiser skin for 975 RP in the LoL in-game store. Pentakill Olaf decided to take the image of an aggressive hard rock drummer, who is equally well equipped for both the battlefield and the drum set. The standard view of the drummer is always drunk man, in a cowboy hat and with a tattoo all over his back (the tattoo of our beloved band – Pentakill). This skin was reworked recently and I want to note that some new visual effects have been added, such as a new walking animation during Ragnarok and new particle effects. Some sounds have also been changed, but I will not say that this change is striking. Pentakill Olaf is a good example of a quality rework of the outdated skin. All that has been added, and nothing superfluous. Highly recommended for purchase. You can buy Pentakill Olaf skin for 975 RP in the LoL in-game store. 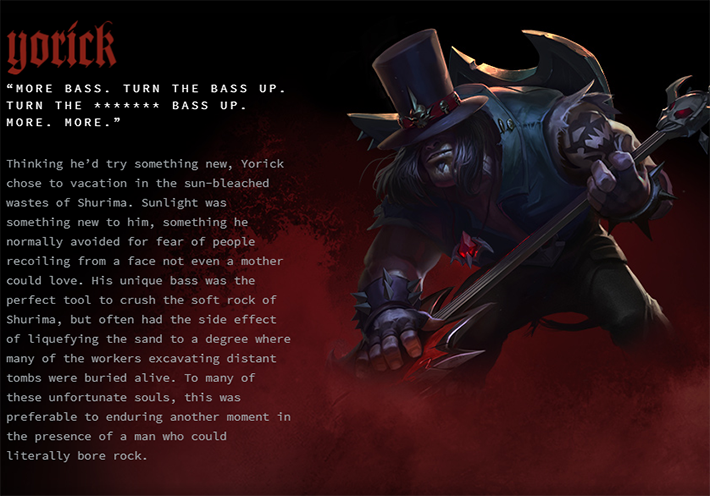 Pentakill Yorick is a grim coffin-maker with a guitar-shovel. The magnificent cylinder reminds of the great guitarist Slash, and the whole image was clearly aimed at this legend. And I want to say that the target was chosen damn true, and this is the image of Pentakill Yoriсk that I like. 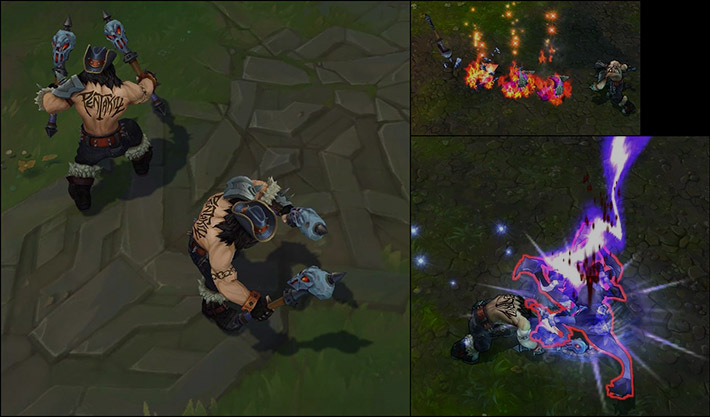 In connection with the recent correction of old skins, Pentakill Yoriсk also received a number of improvements, such as new visual effects. Particles of fire were added to absolutely every ability, as well as for the Maiden of the Mists. Animations, unfortunately, were not added, but he does not need it. But with the sound developers made a great job. A new sound was received his attack, both usual and reinforced and also a new song for the Dance emotion. In connection with the latest changes, Pentakill Yorick began to look much better than before, and I believe that it will become a worthy decoration for any collection. You can buy Pentakill Yorick skin for 975 RP in the LoL in-game store. 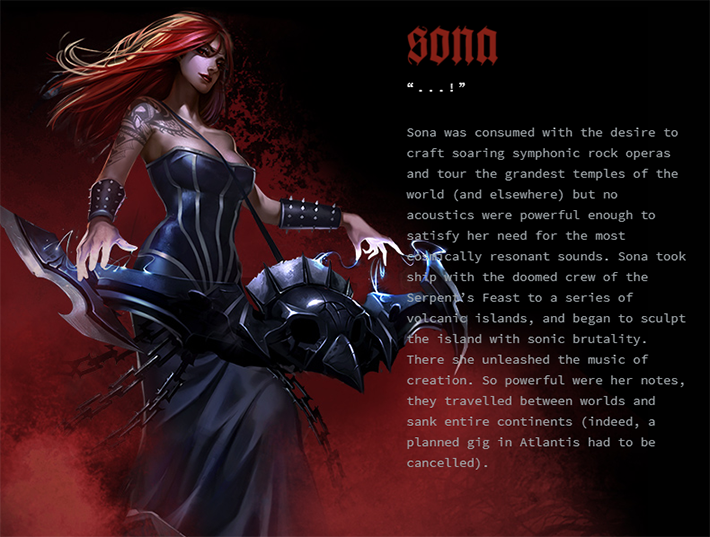 Pentakill Sona is a fiery red-haired keyboardist in the legendary Pentakill band. Although in the official clip she was presented to us as a ghostly creature, in fact, it is not confirmed by anything, except the flying chains around the champion. From the technical side, we get a re-model of the champion, made in dark tones, for 975 RP. It’s unclear why her instrument was decided not to be portrayed as a keyboard, although in the description of Pentakill’s group Sona is obviously withering up as a keyboardist. See her on the battleground with such instrument is very strange. Even after the rework of the Pentakill skins, Sona did not get almost any visual improvements, which embarrasses me. If you are not embarrassed then buy this skin safely, in all other cases – better wait for a discount or a new rework. You can buy Pentakill Sona skin for 975 RP in the LoL in-game store. At this moment Pentakill metal band has only one official music video, but it is just gorgeous. It was executed in the lovely Riot’s way and have a beautiful SFX and VFX in it. I highly recommend it to anyone who loves the Metal genre, even if they never played LoL at all. Such talented album was released by a Gaming studio, this is just wonderful. The most annoying champions in LoL – Who are they? Map awareness in League, what is it and why it is so important? Meta-gaming | What is it and Why it makes problems sometimes? The music clip is just awesome while old pentakill skins like the Sona’s one really need a rework. Pentakill Kayle rocks though.